Dr. Cox and Julie will host another hour-long (free) webinar on current chiropractic statistics and research that impact the chiropractic practice of treating musculoskeletal pain conditions like back pain, neck pain, arm pain and leg pain. Dr. Cox will share patient cases from his clinical practice as well and Julie will share how case reports like this find their way into the Cox Technic Complete program websites that the patients with these types of conditions can read and see that Cox Technic helps. Discussion will include chiropractic clinical experience, chiropractic website design program, The Cox Table use, and Cox Seminar opportunities. Dr. Cox and Julie will host another hour webinar on current chiropractic statistics and research that impact the chiropractic practice of treating musculoskeletal pain conditions like back pain, neck pain, arm pain and leg pain. Dr. Cox will share patient cases from his clinical practice as well and Julie will share how case reports like this find their way into the Cox Technic Complete program websites that the patients with these types of conditions can read and see that Cox Technic helps. Discussion will include chiropractic website design, The Cox table use, Cox Seminar opportunities and chiropractic practice. Dr. James Cox and Julie Cox-Cid present a FREE WEBINAR on Cox Technic: Meeting the Demand for Chiropractic and Evidence-Based Care and How Cox Technic Complete keeps you and your patients in the loop. Wednesday, May 11, 2011 - 12:30pm EDT - Reserve your seat now! Dr. Cox will emphasize the documented Cox Technic System of Spinal Pain Management and share how Cox Technic Complete allows chiropractors a professional online, internet presence that emphasizes their skills. an internet presence - website - to differentiate your practice as the chiropractic practice for spinal pain relief. Cox Technic Complete is the complete program for the chiropractor who treats spine pain patients and wants to differentiate his or her chiropractic practice for success. In the meantime, you are invited to get more information about Cox Technic, get more information on the CTC program or simply sign up to get started with the CTC program now. Call 1-800-441-5571 for more information. Healthcare debate swirls. Physicians want to do what is best for patients. Patients want to be well. We all want affordable healthcare but aren't sure how to make that a reality. Check out this news item just posted at http://www.coxtechnic.com/news/todays-healthcare-demands-evidence-cox-technic-is-ready. Chiropractic has its place. Patients like the care. Tell the patients you are right for them and their health. After reading the article above, check out how Cox Technic Complete may help tell the community what you do well. As a certified Cox Technic physician listed (inactive or active or lost), you may have a hyperlink from the general referral directory for your specific area like this to your own personalized page like this. A personalized directory page on the Cox Technic website enhances your connection with Cox Technic and your role as a spinal manipulation, non-surgical back pain specialist. Take advantage of this opportunity today. Contact us if you have any questions. The Cox Technic Complete® program differentiates the chiropractic practice focusing on back pain, neck pain, arm pain, leg pain relief...because people are searching for chiropractors for back pain relief! 3 million Google searches look for chiropractic each month. You want your local practice to appear before patients who search for you, the back pain specialist chiropractor, locally. Cox Technic Complete® offers search engine optimized content (updated automatically each week with current research), graphics, animations, and videos to show patients that you are competent, are up-to-date with back pain care, are the right choice for their back pain relief. Cox Technic Complete® entices potential patients to call you. Cox Technic Complete® does it for you. Cox Technic is known for its RESEARCH, its REFERENCES, its RESULTS. and, new patients want to contact you for help. Differentiate. Be the back specialist in your community with Cox Technic. Get new patients who are wanting your help. See the video demonstration at www.coxtechniccomplete.com. Contact us for a personal tour of the admin control section. 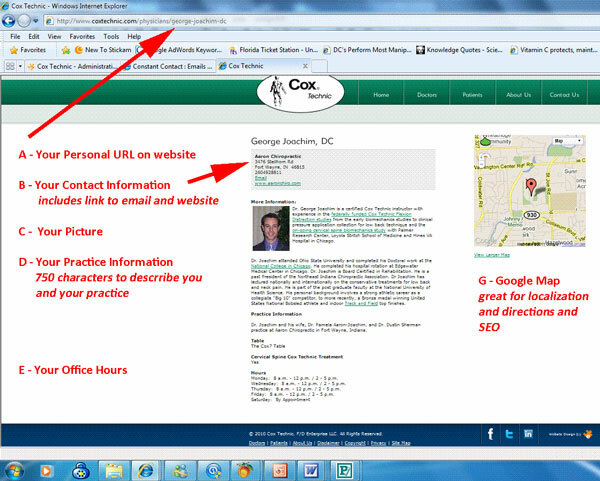 The Cox Technic Complete® new marketing/website/patient communication tool is ready for your practice! A new introductory video to its functionality and offerings (lots!) with preview pages of the content is ready at www.coxtechniccomplete.com. Bill (260-407-1761 bgardiner@cirrusabs.com) and Angie (260-443-7904 akirkpatrick@cirrusabs.com) are ready to host a personal online preview with you at your convenience if you like, too.